Today, we dip our toes back into the pool of cooperative tabletop board games. We've previously delved into the rich Lovecraft universe with an article covering Elder Sign. Moving beyond the fast paced, dice rolling puzzle aspects of that game, we come to the Great Old One of Cthulhu games, Fantasy Flight's colossal epic, Arkham Horror. 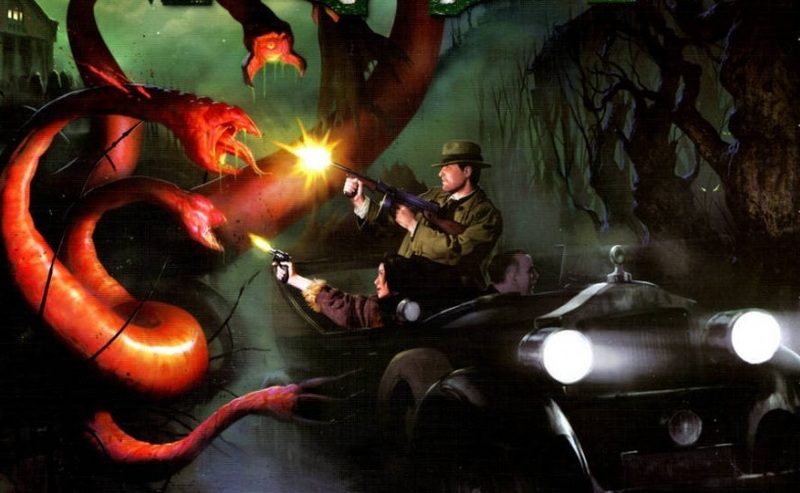 Arkham Horror was originally developed in 1987 by Chaosium, publishers of the Call of Cthulhu role playing game. The game was designed by Richard Launius, who would later design other solid co-ops: the aforementioned Elder Sign and the heroic Defenders of the Realm. In 2005, Fantasy Flight obtained the rights, and gave it a few rules tweaks to bring them design to modern standards, while giving it the luxurious components and art treatment they are so well known for. Since that time, Arkham Horror has been revised once and has had no less than eight expansions, as well as a host of accessories and even a companion app. One of the key aspects of Lovecraft's stories was a sense of dread and foreboding, a feeling that no matter what you might do, in the end, you would lose your mind or even perish at the hands or tentacles of some horrific monstrosity from beyond. Arkham Horror interprets this sensibility as a board game quite well. As you play, the forces of evil spread far beyond your ability to combat or otherwise control them. Characters die, or are driven insane, and things rarely if ever go as planned. Arkham Horror is not a game for the easily discouraged. It is highly likely that you will fail at repelling the invasion of the Great Old Ones, dooming the world forever. This may drive some potential players away, but win or lose, there are few experiences quite as memorable in board gaming today. One of my favorite gameplay mechanics is variable player powers, and Arkham Horror provides a large group of heroes of varying abilities for players to choose from. These characters are known as Investigators, and are fleshed out thematically with a background and an occupation. Each Investigator has a certain amount of starting Stamina and Sanity, which are like hit points for your body and mind, respectively. There are also paired stats, like Sneak/Speed, where there is a slider on a spectrum. Each turn, players can choose to adjust from one end to the other, or somewhere in the middle. It's a unique system, and gives you plenty of interesting choices. Each Investigator has different starting items, spells, and other abilities that further differentiate them from one another. The different characters are interesting and add to the sense of immersion in the theme. Page created in 0.9793 seconds.